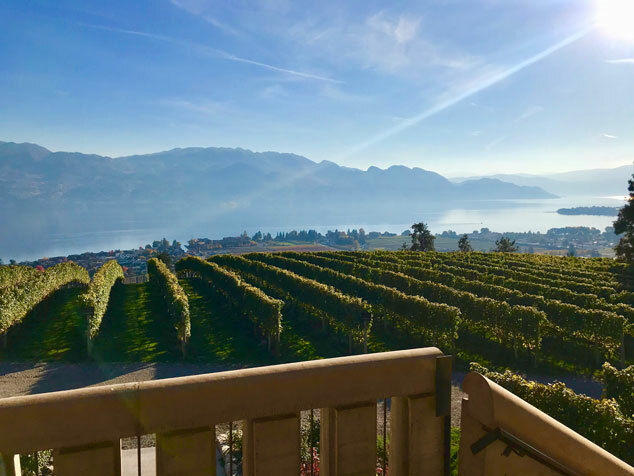 Mission Hill winery is one of Kelowna’s first family-owned wineries. They were also first to bring international acclaim to Okanagan wines winning an Avery award for their 1992 Chardonnay at the International Wines and Spirits Competition judges were so shocked an Okanagan wine won they repeated the blind tests with the same result). Now Mission Hill aims to have Canada’s biggest organic vineyard. Two years into a five-year process they are converting 1,200 acres to organic farming. Perhaps wanting more sleep, they researched other methods of pest control and found chickens eat worms. “So now we have chickens in some of our vineyards,” Nordin smiled. The vineyard also made bottles lighter to lower logistics without decreasing wine quality. They have partnered with the University of British Columbia to try to recycle wastewater on-site or use in a biofuel program. Although the move to organic certification is recent, guests will see earlier indications that owners were sensitive to the landscape. Cellar walls are bare volcanic rock, helping with humidity control, and the gate to the property is so narrow only one car can pass at a time. That and the distance from the parking lot to the winery force visitors to slow down. All the better to enjoy the wine and the connection to the land providing it. Chickens make better wine? Click to Tweet. This BC winery is working on these amazing sustainability initiatives. Discover more: Click to Tweet.